Exceptions are the objects representing the logical errors that occur at run time and makes JVM enters into the state of "ambiguity". 2.What are the differences between exception and error. An Error is a subclass of Throwable that indicates serious problems that a reasonable application should not try to catch. Most such errors are abnormal conditions. Exceptions can be handled using try catch blocks. 6.What is throw keyword in java? Throw keyword is used to throw exception manually. Whenever it is required to suspend the execution of the functionality based on the user defined logical error condition we will use this throw keyword to throw exception. As we know finally block will always executes even there is an exception occurred in try block, Except System.exit() it will executes always. 8.Can we write multiple catch blocks under single try block? Yes we can write multiple catch blocks under single try block. The block of statements to which the control would never reach under any case can be called as unreachable blocks. Unreachable blocks are not supported by java. By extending Exception class we can define custom exceptions. We need to write a constructor for passing message . 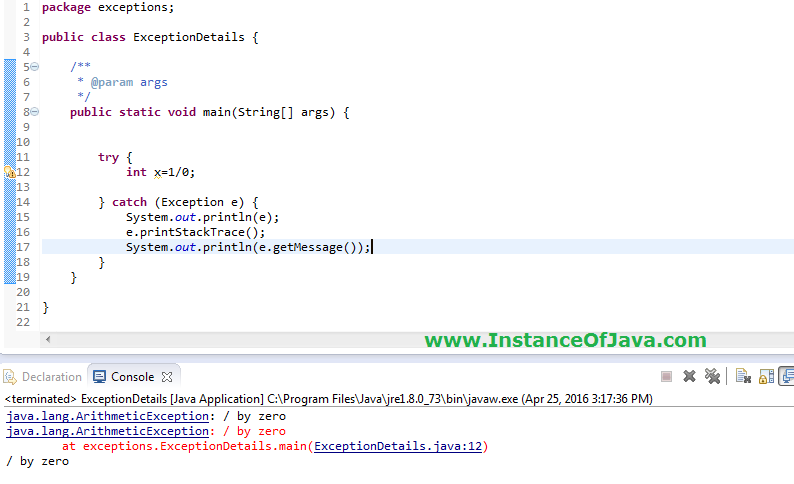 11.What are the different ways to print exception message on console. 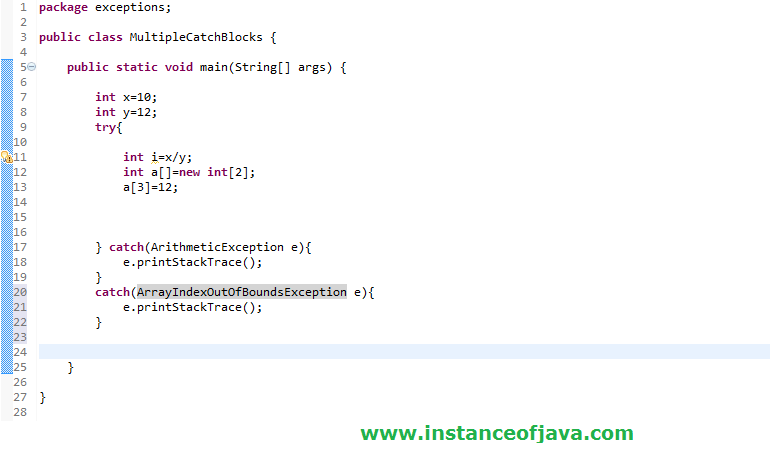 In Java there are three ways to find the details of the exception . Using public String getMessage() method. Using throws keyword we can explicitly provide the information about unhand-led exceptions of the method to the end user, Java compiler, JVM. 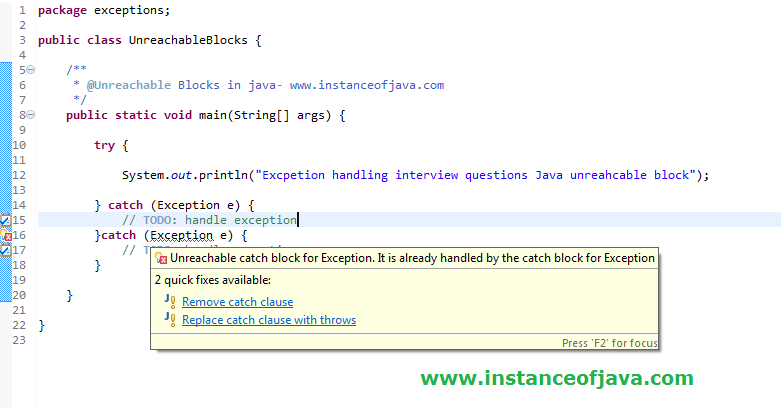 16.Can we change an exception of a method with throws clause from unchecked to checked while overriding it? If super class method throws exceptions in sub class if you want to mention throws then use same class or its sub class exception. 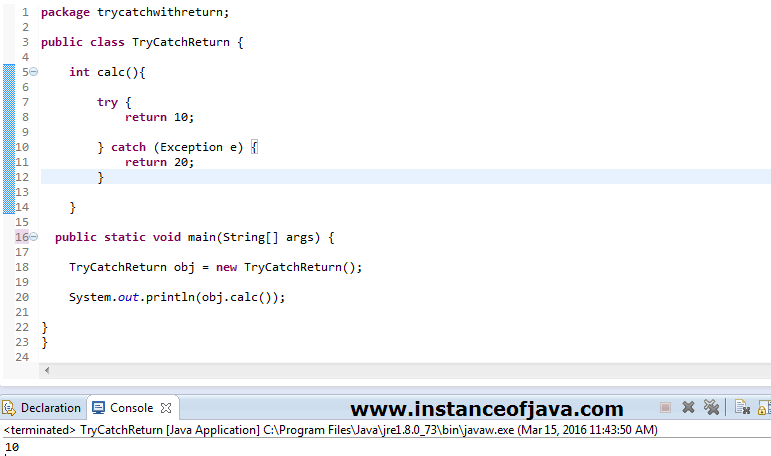 17.What are the rules we need to follow in overriding if super class method throws exception ? If sub class throws checked exception super class should throw same or super class exception of this. If super class method throws checked or unchecked exceptions its not mandatory to put throws in sub class overridden method. 18.What happens if we not follow above rules if super class method throws some exception. Compile time error will come. 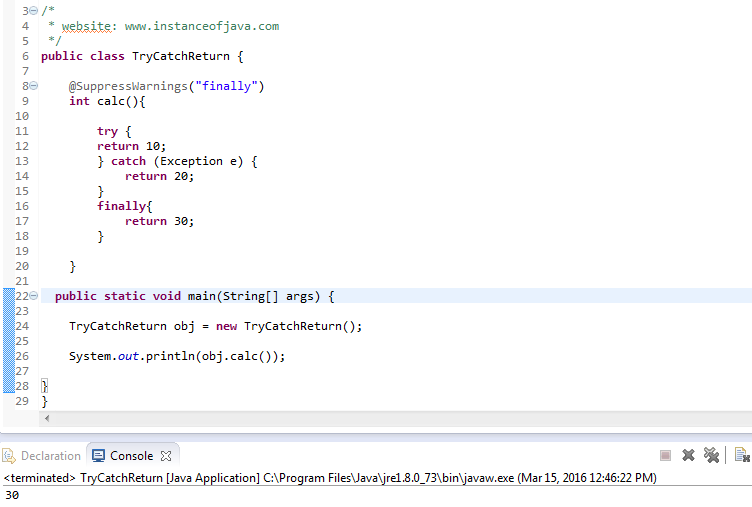 It is not possible prior to java 7.
new feature added in java 7. In Java, if you use a resource like input or output streams or any database connection logic you always need to close it after using. The solution given by using try with resource statement.